Financial Services Regulators' heads and bonuses roll, punished for suggesting they might Regulate Financial Services. "No good deed ever goes unpunished": A cautionary tale from the Financial Conduct Authority (FCA) for Christmas and beyond. In December 2014 FCA heads rolled and FCA bonuses were cancelled. Was it due to a failure to show adequate Authority over a firms' Financial Conduct? To find out, we travel ten months back in time. In February 2014 the FCA published a review of the pensions annuities market. It had noticed there was something rotten going on, and it thought it was about time it thought about looking into doing something about it. But more of this later. “We want to find out how closed-book products [products that are no longer being sold afresh but still have existing customers, such as long term investment products] are being serviced by insurance companies, as we are concerned insurers are allocating an unfair amount of overheads to historic funds. "Intervene on exit charges"!? The prospect of regulators actually doing something to protect consumers shocked the market. There is a sacred covenant in the financial industry that regulation in Britain is the thin end of a thin wedge. Was the covenant being broken? Fearing for their dividends, investors started selling and insurance company share prices plummeted. "fears that insurance companies could lose customers and be hit with huge compensation claims caused their share prices to plunge, knocking around £3billion off their value in several hours." Anyway, heads rolled and bonuses were cancelled. But not the heads nor the bonuses of rogue insurance executives whose naughtiness might have required FCA intervention. "the story was widely reported that day (Friday 28 [sic] March) and the share prices of a number of listed insurance firms decreased significantly. The FCA had issued a statement clarifying the detail of the review in the afternoon. The relevant shares then recovered to a large extent (although not to the previous day’s levels) but some issuers had asserted that there had been a disorderly and false market in their shares for much of the day." The FCA immediately commissioned an inquiry by Simon Davis of the law firm Clifford Chance (fee £2.04 million, excluding VAT). The inquiry was not to be into insurers and their rip-off exit charges but into the FCA itself for suggesting there would be a meaningful inquiry into insurers and their rip-off exit charges. Therefore the FCA retained another law firm to advise stressed FCA staff, Kingsley Napley (fee £1 million excluding VAT). This "Davis Report" came out on 10th December. The report is not entirely unlike the US drama "24", which chronicles 24 hours of grisly mayhem in the life of a US secret agent, culminating in the gruesome deaths of innocent and guilty alike. The Davis Report chronicles 37 days of genteel tut-tutting by the FCA, culminating in the events that months later culminated in the gruesome terminations of several senior careers. It's worth a read if you ever need proof of that old saying "No good deed ever goes unpunished". And provides a detailed blow-by-blow framework for a great piece of theatre (BBC Drama Commissioners please take note). "On 8 December, the FCA presaged the publication of the [Davis] report setting out the findings of the Davis Review by announcing changes to its strategy, structure and senior management team. It has announced that Director of Supervision Clive Adamson, Director of Communications and International Zitah McMillan and Director of Authorisations Victoria Raffe will leave the FCA in January." It was reported elsewhere that surviving members of the FCA leadership, including the CEO Martin Wheatley, had lost their bonuses. "Enhanced Annuities" are intended for those with ailments that shorten their life expectancies. 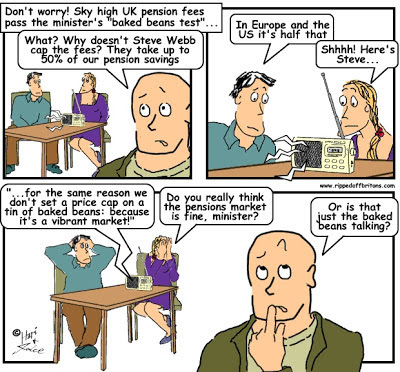 They allow such pensioners to draw on their pensions more quickly, because they won't be drawing them for so long. The FCA report found insurance companies were failing to offer Enhanced Annuities where appropriate. It is a peculiarity of the Annuity system that when a pensioner dies the insurer gets to pocket what remains of the fund - so an early demise saves the insurer money. 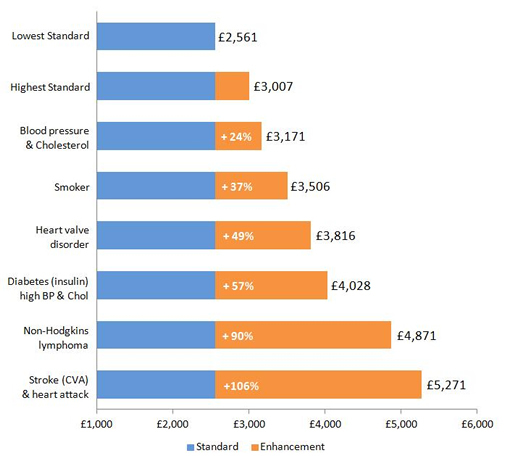 The others are what you can get with a selection of illnesses, compared with the "Lowest Standard"
Pensions are for the long term. 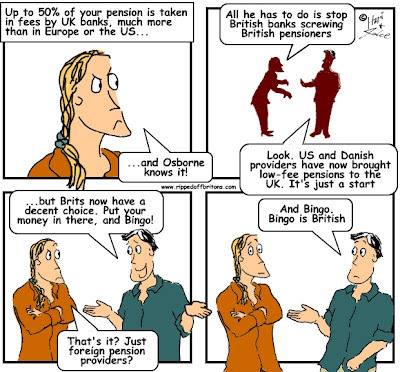 If £8.5 billion represents just 10 years of mischief, then compensating all pensioners could be a debacle on the same scale as the banks' Payment Protection Insurance (PPI) scam. "The FCA's investigation has stopped short of exposing historical pensions mis-selling, which some in the industry had been expecting." "[it is] truly shocking that the FCA’s review uncovers what seems clear evidence of mis-selling, yet is not proposing immediate action to stop it happening any more". The executives of the FCA may be ineffectual, but they aren't stupid. They had learned the bitter lessons of the rollickings, bonus snatchings, and defenestrations since the events of March 2014. After all, what's the point of having a parapet if you are going to raise your head above it? "Savers with low fund values are potentially exposed to the very highest impact of charges. The majority of the AUM [Assets Under Management] potentially exposed to charges over 3% (£0.7bn out of £0.9bn) is held by savers with pots of less than £10,000. Of this, over 90% is held by paid-up savers and savers who have stopped contributing. For such savers the impact of monthly fees can result in very high impacts from charges." When David Cameron piously claimed his 'moral mission' of cutting benefits will make people stand on their own two feet, he made himself ridiculous. "For me the moral case for welfare reform is every bit as important as making the numbers add up: building a country where people aren’t trapped in a cycle of dependency but are able to get on, stand on their own two feet and build a better life for themselves and their family." Cameron's statement is ridiculous because the vast majority of people on welfare are not the unemployed, but are pensioners and the working poor. They depend on welfare because they don't have enough money. Money that is snatched from them by a myriad of scams. Not just by insurance companies with their dodgy investment and pension products, but also by the energy companies, the banks, low paying employers etc. 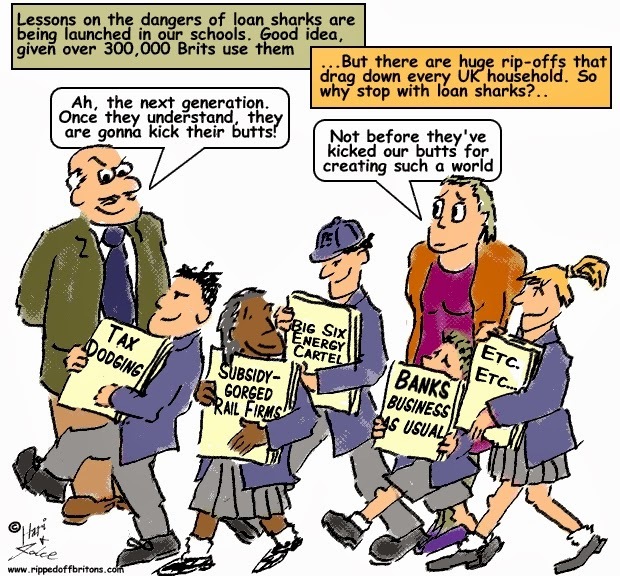 If Cameron actually wanted to do something about the level of dependency, he would do something about the blue-chip rip-offs that cut the ground from under people who genuinely strive "to get on, stand on their own two feet and build a better life for themselves and their family". To be fair, no British prime minister, not Cameron nor any of his predecessors in successive Labour and Tory governments, has thought it would be a good 'moral mission' to stop ordinary Britons being Ripped-Off even of their pensions in the final years of their lives. Politicians don't have the will because they know it would be more than their jobs were worth. 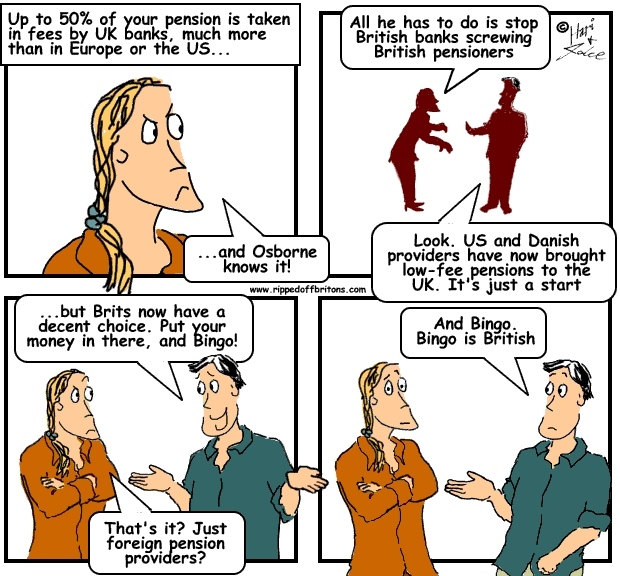 As to the cautionary tale above, using Ros Altmann's figures on annuities alone, £8.5 billion that should be being spent by Britain's pensioners is safely holed up in the coffers of Britain's insurance companies. And FCA staff have been taught a harsh lesson that they are not allowed to intervene. Your bracketed: "and Labour?" in the final scene REQUIRES NO QUESTION MARK! The 2010 General Election featured an illegal Tory 'LiarFlyer' but Labour shied away from address. WESTMINSTER THE ENEMY. Parties are a covert alliance.